We have stocked some amazing 7 metal singing bowls, mini chakra bowls and a variety of deity bowls in preparation of our first Summer Solstice singing bowl mediation with Diane Mandle. Singing bowls produce sounds which invoke a deep state of relaxation which naturally assists one in entering into meditation. In addition to their traditional usage for meditation, Tibetan singing bowls are used for deep relaxation, stress reduction, holistic healing, Reiki, chakra balancing, and World music. Many people find that the rich blend of harmonic overtones which the bells produce have a direct affect upon their chakras.Playing the bells usually causes an immediate centering effect. The tones set up a “frequency following response” that creates a balancing left/right brain synchronization. 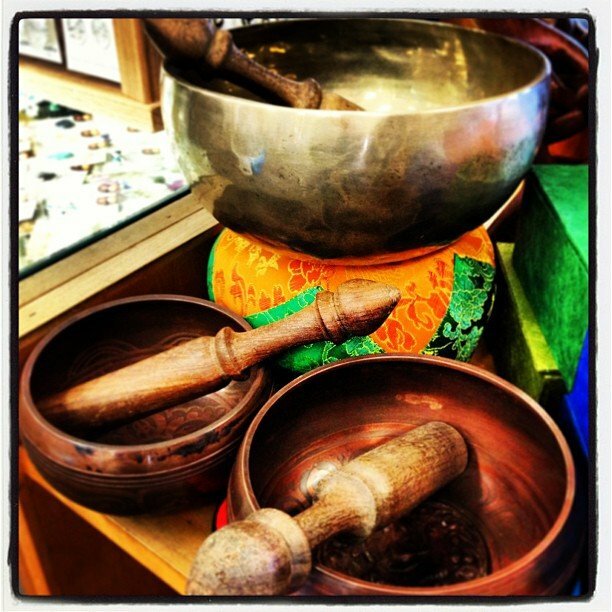 Meditating on the subtle sounds of the Tibetan singing bowl tunes one in to the universal sound within and without.